Baltimore’s Inner Harbor is one of the city’s most beautiful areas and a perfect location for your wedding photography session. Begin your photography shoot at Harborplace and the Gallery on Pratt Street, the cultural center of the Inner Harbor. As you ride down the street in your limousine with your bridal party, your wedding photographer can snap some photos from the street level. When you step out of your limo, you might even be lucky enough to pose with some of the live music groups that constantly appear to entertain the public. 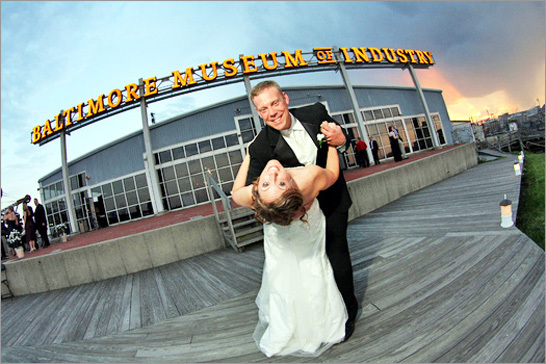 Afterward, your wedding photographer can take a portrait of the bridal party or just the bride and groom on the pier, with the glimmering harbor and Baltimore’s stunning skyline as a backdrop. When you finish your photography session at the Inner Harbor, have your limousine driver take the bridal party to the Baltimore Marriot Waterfront, only a few miles away on the eastern side of the harbor. Walk inside the hotel and your wedding photographer can take some photos of the entire group inside the chic and elegant lobby. Pose in front of the numerous stylish black marble vases and flower bouquets or under any one of the immaculate arches. Step outside and have your photographer assemble the bridal party at the entrance of the towering hotel to conclude your photo shoot here. 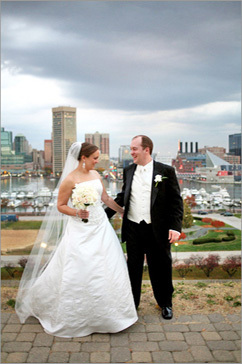 Your limousine driver can then driver the party to Canton Waterfront Park, one of Baltimore’s best-kept secrets. Here, your wedding photographer can take pictures of the bride and groom strolling down the park’s beautiful brick walkway or of the bridal party as they pose on the lush, green lawn. The deck leading out into the harbor is a great spot for an intimate portrait of the bride and groom. 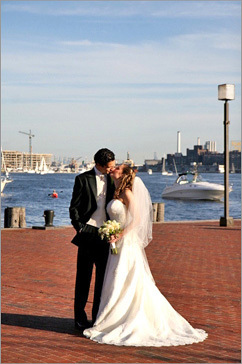 You’ll always remember your wedding photography session on Baltimore’s stunning waterfront! Venture into the historic center of Baltimore for a wedding photography session you won’t soon forget. Start your photo shoot at the majestic Baltimore Basilica, America’s first cathedral. Your photographer can arrange the bridal party on the front steps of the cathedral, with its pure white Roman columns standing stoically in the background. From a different angle, your photographer will be able to capture Basilica’s great dome, as well as its stunning twin spires. Venture inside and take photographs with the beautiful white interior as a backdrop. Once you’ve finished here, take a short limo ride (or a walk) over to Mt. Vernon Square, a National Historic District of Baltimore. Here your party can pose in front of the magnificent Washington Monument or beside a statue of George Washington, himself. Then ask your photographer to take a portrait of the bride and groom on the steps of the gorgeous Carnegie Library building, home of the Historical Society of Washington, D.C. Finally, for an artistic finish to your wedding photography session, drive over to Baltimore’s Lyric Opera House, only a mile from Square. Your wedding photographer can take assemble the party in front of the opera house, whose charming Renaissance architecture will serve as a perfect backdrop. After you’ve finished using the hall’s exterior, walk inside and you’ll be amazed by the majesty of the Great Hall. One look and you won’t hesitate to return to the opera house for a performance. Baltimore, Maryland is home to numerous prestigious universities and each offers its own distinguished campus setting. Within the closest proximity of each other are Johns Hopkins Universityand the College of Notre Dame of Maryland. You can begin your wedding day photography session at the latter campus, which is one of the oldest women’s colleges in America. Here you can take photographs in front of the magnificent Gibbons Hall or you can explore the polished wooden Marikle Chapel of Annunciation. Outside the red brick exterior for Fourier Hall you’ll find lush green lawns that will be perfect backdrops for your wedding photographs. Once you’ve finished exploring the College of Notre Dame, take a short limousine drive over to Johns Hopkins University, one of the top private research institutions in the nation. The main campus, located in the northern Baltimore, has a park-like design that will be great for your wedding photography session. Have your photographer assemble a portrait of the bridal party or of the bride and groom in front of the campus’s front gate. From there, you’ll find countless elegant buildings to use as backdrops, including Homewood House (boasting its gorgeous Federalist Period architecture), Gilman Hall, and the impressive Peabody Library. Your wedding photographer can also utilize the campus’s numerous verdant lawns as backdrops for portraits of the bridal party. After you finish, you’ll agree that these two campuses were great choices for your wedding photography session.